BOZEMAN — Biologists have discovered high levels of pesticides and other contaminants from marine mammals in the tissues of endangered California condors living near the coast that they say could complicate recovery efforts for the largest land bird in North America. 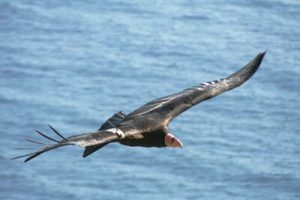 “Even though marine mammals are a potentially abundant food source for condors, they might not be that safe to eat,” said Carolyn Kurle, an assistant professor of biology at the University of California, San Diego and one of the senior authors of a study published recently in the journal Environmental Science and Technology. The study found high levels of persistent contaminants in California condors inhabiting the central California coast compared to inland condors. California condors, vultures that feed on the carcasses of dead animals, were driven to near extinction in the 1980s, but their population has grown to more than 400 birds today due in large part to the efforts of the California Condor Recovery Program. However, condors are not out of the woods yet. Research demonstrates that lead poisoning from feeding on carcasses contaminated with lead-based ammunition is the principal threat preventing condor recovery. Some California condors that were reintroduced into the wild in recent decades as part of recovery efforts supplement their diet with carcasses of marine mammals, which are less likely than land-based animals to contain lead in their tissues. Because marine mammal carcasses can be an abundant food source for coastal scavengers and are thought to have helped prevent the extinction of California condors at the end of the last ice age, 11,700 years ago, biologists welcomed this type of oceanfront dining as a likely boon to the condors’ recovery. But Kurle and the study’s two other senior co-authors, Victoria Bakker of Montana State University and Myra Finkelstein of UC Santa Cruz, found that coastal condors had 12- to 100-times greater mean plasma concentrations of mercury, chlorinated pesticides, polychlorinated biphenyls (PCBs), and polybrominated diphenyl ethers (PBDEs) than noncoastal populations. Although the pesticide DDT has been banned in the United States since 1972, the scientists found elevated levels of a highly persistent metabolite of DDT known as DDE in coastal condors as well as in marine mammals. Kurle used a technique called “stable isotope analysis” to demonstrate that condors in the Central California flock, near Big Sur, fed on dead marine mammal carcasses on the beaches. She also showed that inland condors in the Southern California flock had isotope values indicative of feeding on terrestrial animals. “The problem with condors eating marine mammals is that (the marine mammals) contain significant amounts of contaminants that have been shown to harm reproduction in other birds and are therefore a potential threat to the ongoing recovery of California condors,” Kurle said. Bakker, an assistant research professor in MSU’s Department of Ecology in the College of Letters and Science, analyzed the levels of DDE in the blood plasma of condors and records of their observed behaviors over nearly two decades and found that the best predictor of a condor’s DDE level was the number of years it had been observed feeding on marine mammals. She used simulation models to extrapolate study results flock wide, predicting that about 40 percent of breeding-age coastal condors have DDE levels at or above levels that caused eggshell thinning in bald eagles and about 20 percent meet or exceed levels associated with nest failure in bald eagles. “DDE is highly persistent and can accumulate in apex predators such as California sea lions and California condors,” Bakker said. “Our results indicate that ongoing marine foraging elevates DDE levels in condors, even for birds just entering the population today. “Our study has conservation implications as condor biologists work to maximize the California condor’s potential for population recovery,” Kurle said.